In-person assister Matthew Olson helps a homeless man enroll in Obamacare. At the House of Charity homeless shelter, Matthew Olson is the "Obamacare guy." On a recent Wednesday morning, he sits in a bustling conference room along with service providers from Goodwill, Spokane Mental Health and the YWCA. He's sharply dressed in slick, black frames, a lilac button-down and coordinating tie. He has an iPad in front of him on the conference table with the Washington Healthplanfinder website bookmarked. Today, he's helping an older gentleman named Glen sort through a folder of unopened mail. Olson enrolled him in health insurance online weeks ago, but Glen wants reassurance that it worked. They're searching for his new state Medicaid card. "I'm going to try to get into treatment," Glen bashfully admits as Olson tears open an envelope to find his missing card. "I haven't done nothin'. This guy has done it all. He even opens the letters!" Olson is one of three in-person assisters, or "IPAs," for Catholic Charities of Spokane. Armed with iPads and a crash course in the Affordable Care Act, they're dispatched to hospitals, Catholic parishes and homeless shelters in search of the poor and uninsured. Bishop Blase Cupich: "We consider health care a basic human right." Eventually, Rob McCann, the executive director of Catholic Charities, hopes they can set up shop at Walmart just like the Girl Scouts. "We've basically sat down and strategized: How do we go out to the poor and find them? The truth is some people — their lives are in such chaos ... the idea of finding a bus and finding a ride is too much, so we have to go to them." McCann says. "We're not targeting the middle class with this." There are approximately 100,000 uninsured people in Eastern Washington, about a third of whom are eligible for free or low-cost health insurance. Better Health Together, the agency leading the region's in-person assister network, hopes to enroll 10,000 people by the end of this year. McCann estimates his IPAs have signed up more than 300 people so far. "It's a game changer," McCann says. "This is a magic moment for our country, where we can get to tens of thousands of people who have been living in the shadows and get them health care and make them healthier." Despite recent headlines about its opposition to the Affordable Care Act's contraceptive mandate, the Catholic Church has long endorsed universal health care reform. The idea to reach out to Eastern Washington's most vulnerable residents came from Bishop Blase Cupich, who leads the Diocese of Spokane. Cupich approached Catholic Charities and Providence Health & Services about collaborating with the church to enroll the uninsured. 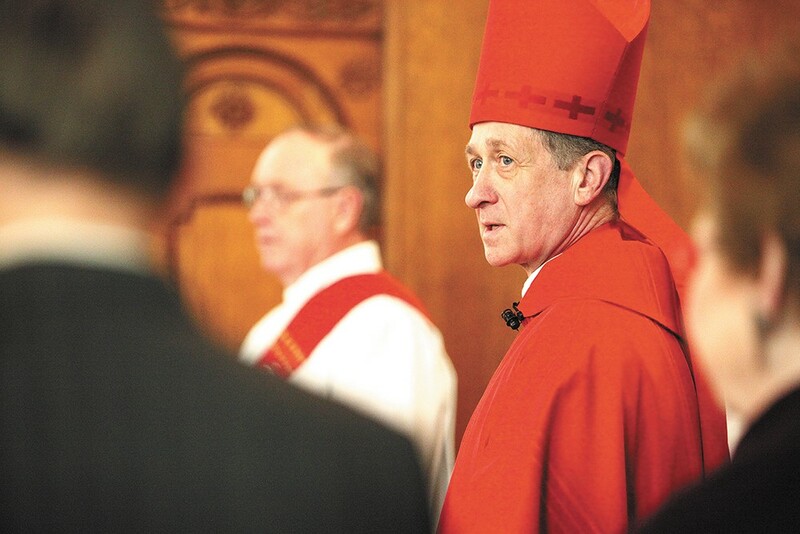 Supporting access to health care, Cupich says, is consistent with the church's teaching on respect for human life. "We consider health care a basic human right and we believe that people should have access to affordable health care in order to live a full life," Cupich says. "We want to make sure that people who do not have ready access to affordable care do. This is a program that does allow this to take place." Of course, serving the poor isn't without logistical challenges. The Washington Healthplanfinder website, for example, requires email addresses from prospective enrollees, which the vast majority of Olson's clients at House of Charity lack. So Olson has to create email accounts for them. Then there's the issue of verifying their identities. The health exchange identifies applicants by pulling in data from federal agencies like the Internal Revenue Service and Social Security Administration. But Olson has found that many of his homeless clients haven't interfaced with these agencies in years, particularly because they haven't worked, so they "don't exist in the system." He's had to manually verify the identity of about a third of his clients, which often requires helping them obtain an ID or a birth certificate. 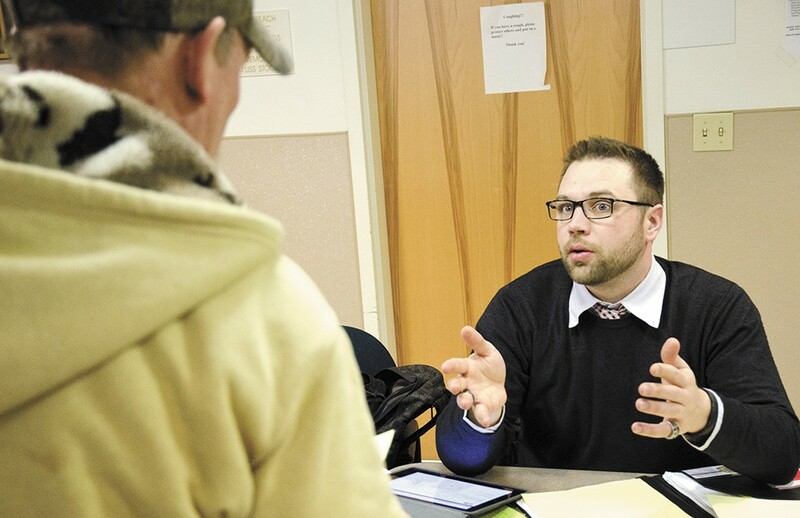 But the effort pays dividends in success stories: Since he started working at House of Charity in November, Olson estimates he's signed up more than 120 people for health insurance — Medicaid mostly — at the homeless shelter. He helped enroll one man with bipolar disorder, who after obtaining coverage was able to pay for his medication and get stabilized. Soon after, one of the case workers at House of Charity got him into housing. "When I last met with him, I was helping him create a résumé and do a job application," Olson says. The average homeless person lives to age 47. Thanks to Medicaid expansion under the ACA, homeless men and women who were previously ineligible for no-cost government insurance now will have access to comprehensive, life-saving health care, says Barbara DiPietro, director of policy at the National Health Care for the Homeless Council. Meanwhile, people who get sick or injured and can no longer work are now able to get affordable treatment before sliding into bankruptcy and homelessness. "We like to say that homelessness is hazardous to your health, in that poor health can cause homelessness, and the experience of homelessness can exacerbate those conditions and causes new ones," DiPietro says. "Because we're able to get people better health care, we're hoping to be able to stabilize peoples' poor health in a way we haven't been able to do before." Back at House of Charity, Venroy Ogle is the only man in a wheelchair eating lunch — hearty soup, a chunk of bread and sheet cake — in the shelter's cafeteria. He wears his hair in tight dreadlocks beneath a winter beanie. A catheter hangs on the leg of his jeans. Ogle is a Jamaican national who moved to Washington state with an agricultural guest worker visa to pick apples in Brewster. Two years ago, after the harvest ended, Ogle traveled to southeast Texas to visit his sister for Thanksgiving. The night before the holiday, Ogle was a passenger in a car with his sister's husband and her husband's brother. The two men had been drinking when their car ran off the road. Only Ogle survived the crash, but he severely injured his back, immobilizing his body from the waist down. At the beginning, Ogle says he was "like a newborn baby": He couldn't bathe, get dressed or step in and out of a car on his way to his numerous medical appointments without assistance. He didn't have any health insurance, so his bills piled up. When he met with Olson in November at House of Charity, he found out he wasn't eligible for Medicaid, but he could get coverage under Washington's Alien Emergency Medical Program. Now Ogle receives physical therapy from St. Luke's Rehabilitation Institute, where he practices bending his knees and putting pressure on his legs.